The Pier cafe bistro was always a favourite of ours on family visits to Aberdeen beach, so I was saddened when it was destroyed by a fire at a neighbouring restaurant. I was shocked to discover that was more than four years ago, and even more surprised to hear that the re-built and re-opened Pier has been trading for the best part of a year. 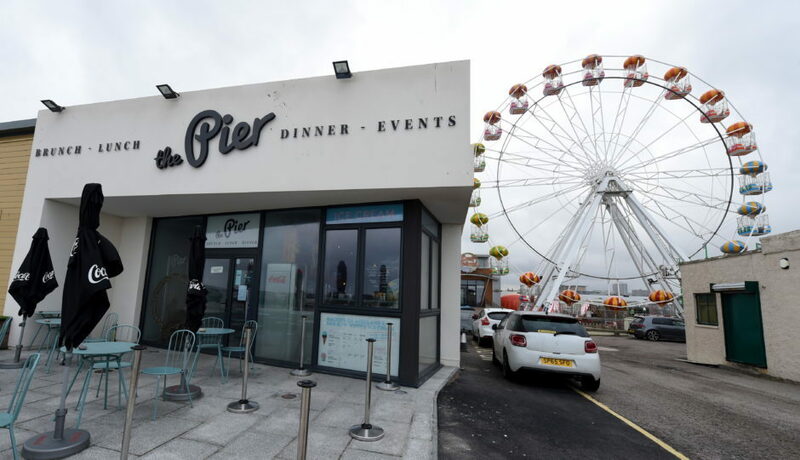 The new Pier is located in the same spot as the old one, has the same owners and even the same ice cream machine – salvaged from the wreckage of the original building. But any similarities end there as the layout and decor are a marked departure from the first incarnation. What strikes you as you walk in is the fresh, open feeling of the place and its lovely nautical theme. The layout of the bistro is different, but what has stayed the same is its popularity. We arrived just before 3pm on a blustery Sunday afternoon, looking for a late lunch before dropping number one child off at Transition Extreme for a party. The mini Beast from the East was still in full force and the wind was whipping up some impressive waves, so we were glad to get into the cosy surrounds of The Pier. You can’t book a table at the weekend, so we knew we were chancing our luck, and things didn’t look good as every table was full and there were a few people ahead of us waiting to be seated. We stood for the best part of 10 minutes without acknowledgement from the staff, which is a bugbear of mine. Eventually my wife stopped a passing waitress who informed us we’d have to wait 10-15 minutes, but luckily, soon after, a table became free and we were quickly seated and reading through the menus. A good choice of lighter bites sits alongside more substantial offerings, supplemented by a specials board which, on our visit, offered spicy pork ribs, creamy chicken curry, a beetroot and feta salad and fish tacos. Quite a varied selection. We all seemed to be in an adventurous mood, so the kids decided to share some pancakes with bacon and maple syrup from the children’s menu. I’ve always thought this to be a strange combination, but I know lots of people like it. And you can now add my two to that list as they both loved the dish and gave it the thumbs up. My five-year-old daughter even said she wished she had her Strictly Come Dancing live show paddle with her so she could have given it a 10. My wife and I both went for the nachos: hers served with salsa, guacamole, cheese and sour cream, mine the same but with some added pulled pork. These were served in old-fashioned pie dishes with separate bowls for the sour cream and guacamole. 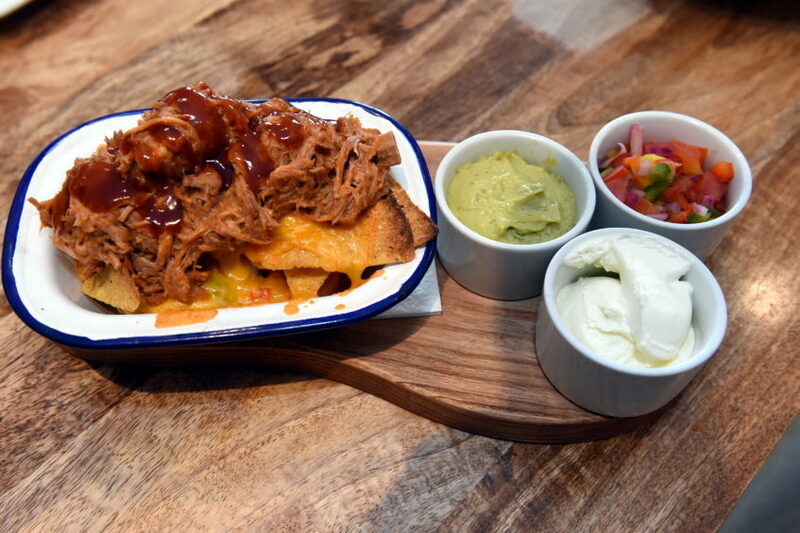 While both the nachos and the pulled pork were in plentiful supply, we both agreed the dishes could have done with more cheese. After the initial wait at the door, the service was slick, friendly and professional, and the food came out nice and quickly, which was much appreciated as our children were ravenous and are not the most patient. So when the main courses arrived shortly after our starters were cleared away, we were all very pleased. Sticking with the adventurous theme – and the Mexican one – I ordered the fish tacos from the specials board. I had commented when I first noted them on the board that I had never fancied fish tacos as I don’t like the idea of fish in Mexican food, in much the same way I steer clear of fish in Indian cuisine. However, I was glad I had been brave and chose this as it was delicious. 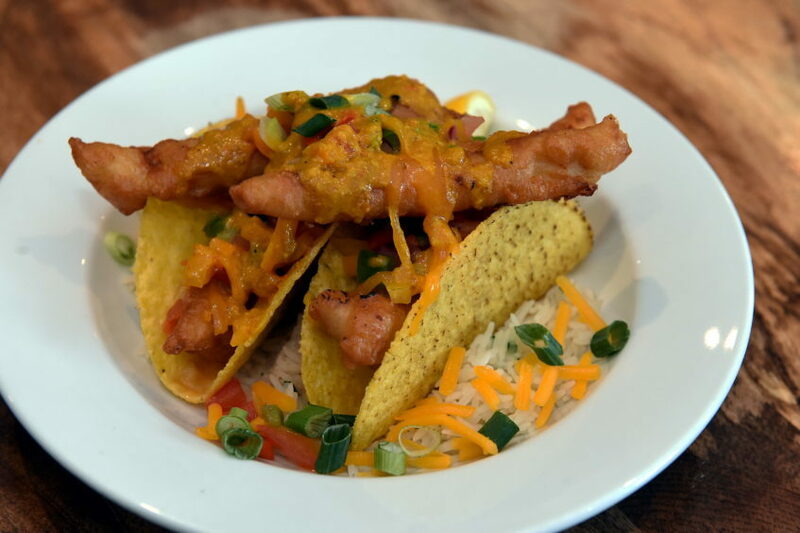 The two taco shells – served on a bed of lettuce – contained battered haddock topped with salsa and “phat taco” sauce. The haddock was as white as the snow brought by March’s Beast from the East and the salsa was light and fruity. I particularly liked the inclusion of pineapple in it. 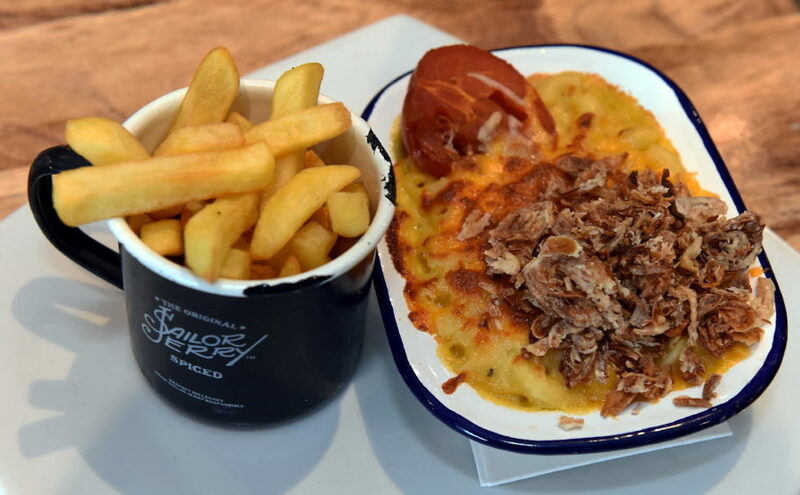 My wife’s mac ‘n’ cheese came topped with crispy onions, which she loved, and the sauce was rich and creamy. The portion was just the right size too. My son enjoyed his baked potato with beans and cheese, while my daughter only managed half of her burger. I tried it and was impressed with the meat. It wasn’t the usual frozen, processed burger often found on a kids menu, but the flavour and the way it was cooked may well have been too sophisticated for a child’s palate. Despite being fairly full up, my wife and I decided to share a Tuck Shop Sundae while our daughter enjoyed a cone with chocolate ice cream. Both went down a treat, with the sundae coming packed full of “all of your school time favourite treats” which included jelly beans, jelly babies and white chocolate buttons with sprinkles. Wonderful. As well as the daytime menu, The Pier also offers evening meals and tempting deals Wednesday to Saturday. I for one am looking forward to what looks like a great-value evening on April 27 – The Big Cheese – where for £20 a head you receive a sangria on arrival and can then “enjoy all the cheese, breads and meats your heart desires”. Sounds like a winner to me. 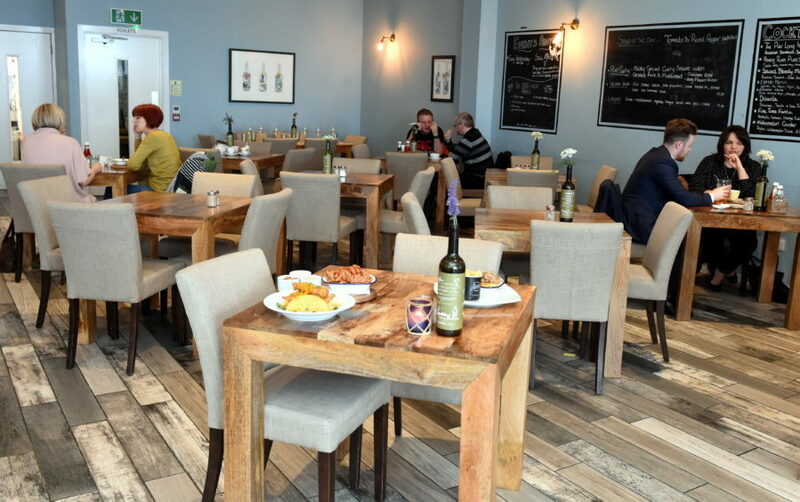 Overall we thoroughly enjoyed our visit to the new Pier and all of its nice little touches such as the dainty china tea cups, milk served in miniature milk bottles, wine lists on the side of wine bottles and hot chocolates and sundaes served in jam jars with handles. And that’s without mentioning its craft beer and cocktail selections. So now that we’ve sampled lunch, we’ll definitely be back for dinner.